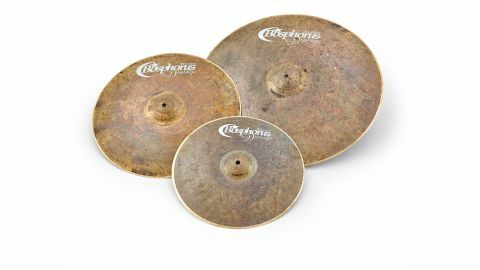 These unique cymbals truly deserve the appellation 'Master Vintage'. Dark, complex tones. Fine hand-hammered build. Excellent playability. Bosphorus says its Master Vintage series is "the embodiment of our philosophy and represents [the company's] absolute finest work". So do its latest cymbals live up to this bold claim? We've been sent 14" hats, a 16" crash and 22" ride, each from the Master Vintage series. All bear the scars of their hand-hammering proudly, the hammer marks resplendent across the unlathed cymbal from bell to just before the edge, where there is a thin golden line of lathed metal on each cymbal. Starting with the ride, it's immediately apparent that despite being mostly unlathed, it is a very thin cymbal with a pronounced edge wobble under anything more than moderate sticking. "Light strokes are articulated cleanly, with a metallic edge even when played with wood-tipped sticks"
Light strokes are articulated cleanly, with a metallic edge even when played with wood-tipped sticks, but the initial strike dissipates quickly into a dark, woody fundamental note. Pressing on with faster and heavier sticking patterns induces a roar, but it can be controlled easily - the 22" is an incredibly expressive cymbal. The 16" crash seems, if anything, darker than the ride (though this may be the result of confounded expectation that a smaller cymbal would be of higher pitch). It has a trashy initial attack, and decays quickly, with a complex fundamental note that works well with the ride. It doesn't sing the way a bright finish, heavily-lathed crash would, but it serves to punctuate and accent music very well without overstaying its welcome. Its dark and trashy nature would work well in an electronic music setting as well as a more traditional acoustic setting. Often unlathed hats can struggle to cut through, but this pair wash with a metallic rasp that belies their weight. Closed sticking is clear and articulated brightly, without being too severe, and half-open they fall easily into a lazy wash that can be controlled easily. Pedalled, the 'chick' is pronounced - again, not always a given with 'Turk'-style hi-hats - and struck and then closed, the 'scoop' sound cuts through, making disco-eighths a real possibility. The ride and crash are dark, complex beasts that demonstrate a fiery temperament. The hats are more versatile, able to do dark and smouldering but also capable of sitting more brightly in the mix.